1. Stir the sugar, salt, and 5 tablespoons harissa together in a bowl. Spread the mixture thickly all around the top and bottom of the salmon filet. It should be completely covered with the curing mixture. Place salmon in a wide baking dish, cover dish with plastic wrap and let cure in the fridge for 50 to 60 hours. The longer you let it sit, the firmer the fish will become. 2. Rinse salt and sugar cure from the salmon and pat it dry with a clean dishtowel. 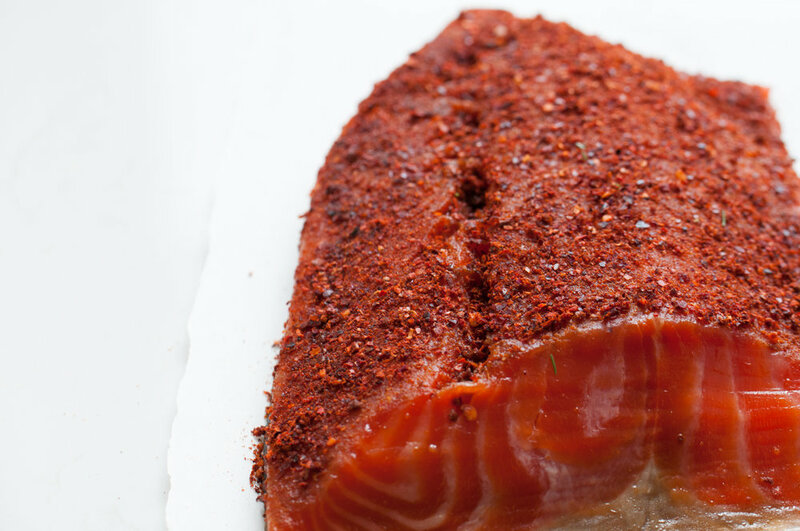 Rub the remaining 5 tablespoons harissa on top of the cured salmon before serving and slicing.